Goodleaf is an intrinsically responsible tourism business; inherent in what we do is a commitment to the natural environment. Recreational tree climbing does not harm trees, in fact it creates an opportunity to educate people about the importance of trees and their vital role in our lives. We remove every piece of equipment from our tree when we’re not using it. We mitigate for any possible soil compaction and effect on the tree’s roots with the laying of wood chip around the canopy using chip from fallen trees from Appley Park where possible – you can’t get much more sustainable than that! Where possible our refreshments are fair trade and our merchandise is ethically sourced – e.g. our camping mugs were designed locally and made in the UK from 100% recycled plastic. We support young people on the Isle of Wight with the offer of raffle prizes for schools and local charities. We subsidise tree climbing for local youth groups. We employ and train local people. We support our local community with the Goodleaf Vertical Marathon which we started in 2012. We’ve raised over £2000 since then thanks to the generosity of our climbers. Charities we’ve supported so far are: Isle of Wight Special Olympics, Isle of Wight Christmas Toy Appeal, Friends of Appley, Gift to Nature, and in 2016 we’re supporting Ryde Inshore Rescue who are based in the park. 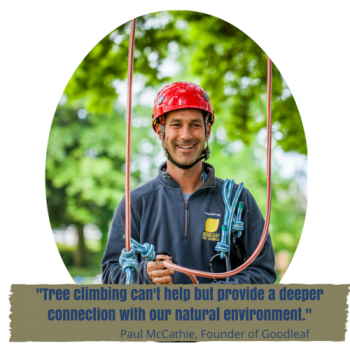 We offer a 5% discount for any tree climbers that travel to the Goodleaf field on public transport, pedal power or by foot. We can give you the information you need on cycle paths, foot paths and bus routes.